First, she asked her lawyer whether there was anything she could legally do against these vulgar insults. 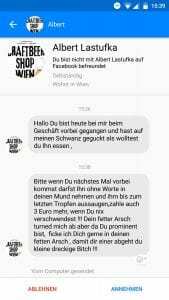 When she was informed that there was no legal redress for this kind of situation in Austria, she took matters in her own hands and published the Facebook message including, the name of the craft beer shop and its owner, on Twitter. She wrote: “I am back (on Twitter) & want to tell you something about Mr. Lastufka. Mr. Lastufka has a small business for craft beer at Strozzigasse 11, where I must walk by every day. Yesterday, he talked to me in an unpleasant way and sent these messages #mindyourcraftbeer”. What happened thereafter was a classical #shitstorm. People wrote insults on the craft beer owner’s Facebook page, they made his Google rating drop drastically and came by his shop to give him the finger, in one incident people even threw eggs and used tampons on his windows. Several passersby called him a “sexist” and an evil man without respect for women. His reaction: “This is lynch law. It wasn’t me. These messages were sent by someone else.” He said that at this date and time he had left his store and had been at the supermarket for twenty minutes. In that time, someone must have used his computer to write the messages, he claimed. Wenn man dem Urteil gegen #SigiMaurer folgt darf man bei keiner Nachricht, egal auf welchen Weg gesendet davon ausgehen das der Absender auch der Absender ist. If you follow the reasoning of the verdict, you can’t be sure about that the sender of any message is truly the sender, no matter how it was delivered. 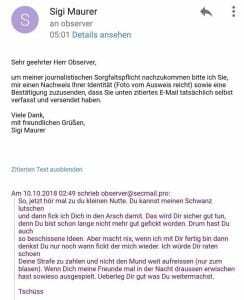 Wenn das #Maurer Urteil hält, ist es der Freibrief für Trollfabriken, Manipulatoren, Raubritter, Diebe, Betrüger, Vernaderer und #hassimnetz . 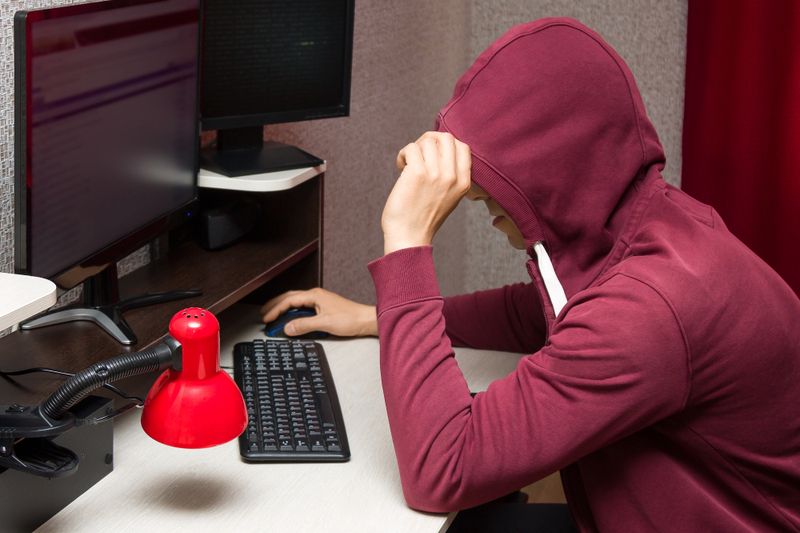 If the #Maurer verdict stands, that’s a carte blanche for troll factories, manipulators, robber barons, thieves, cheaters, vandals and #hateontheweb. A carte blanche for hostility to democracy. Not to mention sexism, misogyny and discrimination. 1. Sexually degrade a woman in the worst possible way. 2. Hope that she will somehow defend herself publicly. The scandal in the story is that #SigiMaurer has and had no legal means whatsoever to take action against these sexist messages. Just like many other women don’t have any legal means. Oider, that’s finally got to change!! Dieses Urteil ist wegweisend. Es ist quasi ein Freibrief für Männer, die Frauen mittels Nachrichten belästigen, degradieren, fertig machen wollen. Sie dürfen das nun ganz offiziell tun, ohne Konsequenzen befürchten zu müssen. This is really happening. This verdict is game-changing. It is a kind of carte blanche for men who want to harass, degrade and bring down women with messages. Now, they can do this officially without having to fear any consequences. This is really happening. But Maurer, who is a former politician and used to be in the Austrian Green Party, does not want to give up. She is going to appeal. pay what You own and to not open your mouth (just for blow jobs). Should my friends get you at night, it is over anyways. Think about how you wanna play this.